Mainly made of aluminum alloy, very sturdy and durable. Max. load capacity is up to 10kg/22lbs. Adopt the most advanced CNC manufacturing process, surface finishing and anodizing techniques, which make the ball head very easy and smooth in operation. Three built-in bubble levels in different directions play an important role in balancing your camera and locating view finding. 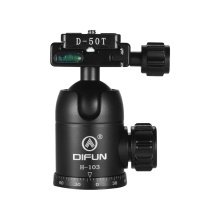 360° panning movement with calibrated precision design makes the ball head being suitable for panoramic shooting.